The smell of rain hangs in the air in the minutes before the storm. There is an electricity, a buzz in the atmosphere and the landscape sits in silent anticipation. The wind reverses and then the rain begins to fall. The clouds pass quickly overhead. The rain comes in mists then sheets and almost as quickly disappears as the winds blow out the storm. Nourished and drenched, the seeds of Spring grow into the flowers of Summer, only to become the yellow banks of grass in the Autumn, anticipating a Winter slumber. Winter is around the corner. The days are becoming short and the season of rainstorms is nearly past. 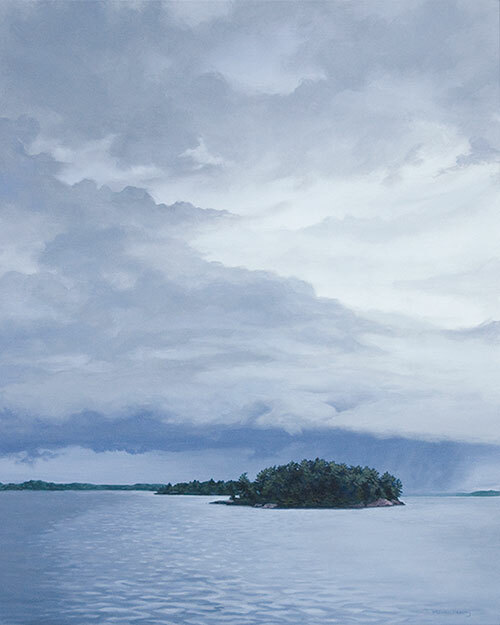 The painting “April Storm” at Muskoka Beach can be seen as a fond memory or the reminder that Spring will one day return. 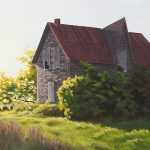 McMichael was a wonderful success last weekend, for both this artist and the Fundraising Committee, reaching record sales. I met some wonderful people, incredibly talented artists and many old friends. The opening coincided with Lawren Harris’ birthday (Oct 23) – Lawren Harris is one of the most well known of the Group of Seven and his work is a major part of the McMichael Collection. It closed on the International Day of the Artist (Oct 25). After months of build-up, I am torn between the anti-climax of show’s end and the anticipation of the quiet studio time that comes with Winter. I look forward to a few days off and a little bit of ‘play’ after such a long period of intense focus. I am hoping to set up a few house visits and get a few more ideas for my winter work. For now, I am excited about one of my favourite days of the year, Hallowe’en, and a walk in the crisp Autumn air before the snow flies. I can’t wait to see the costumes the neighbourhood children come up with! Hi Michelle ~ It’s good to be back. No-one kept me away but myself…but a 50 year addiction to tobacco took a lot of beating (I’m smoke-free now) and I lost the ability to write, read or photograph . 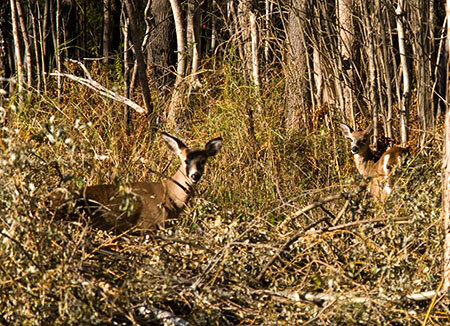 April Storm is stunning…as are the Deer. I’ll need some time to catch up, but I will. It is hard to know isn’t it…do we heave a sigh of relief or sadness when a season/show is finished…a bit of both for me!!! April Storm is gorgeous…the deer shot is great…might be a painting waiting??? 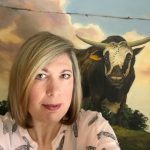 Great photo of you and your paintings! I love how you captured the moment of peace in “April Storm”. FYI: I recall your fondness for a certain Irish band. Thought you’d like this link. 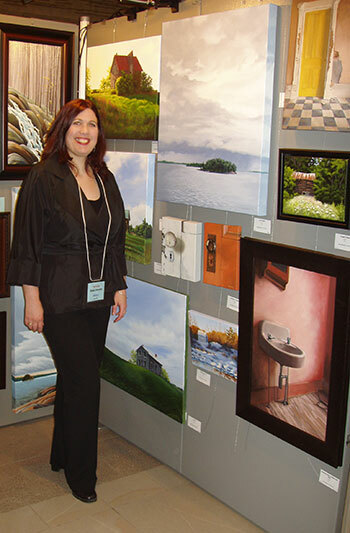 But seriously, congrats on your show; you and your paintings make a stunning group shot. And thanks for treating us to a new painting (at least new to me). Love the big sky painting. Nice to see you again Henry! 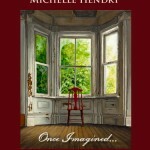 Your paintings are magical and sets the mood for me. April Storm is simply awesome, you have catured the light very well in the sky and on the water, thanks for sharing. Thank you for the wonderful compliment, Fabrizio! Very good concept, I like how you convey the msg. Such a good site. I am saving this page.